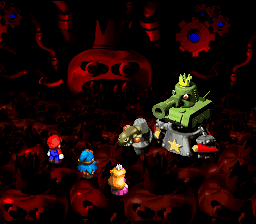 Magnum is a special attack used by Smithy in his tank head form during the final battle of Super Mario RPG: Legend of the Seven Stars. This attack is similar to Blazer, as both can instantly defeat a single party member and both have the same animation. When using this attack, Smithy fires a single golden Bullet Bill (similar to a Bombshell Bill) at Mario or one of his allies. The bullet explodes on impact, instantly defeating the party member unless they have an instant death prevention item equipped, like a Jinx Belt. This page was last edited on December 29, 2018, at 15:41.